There’s a new breed of potatoes on the market, containing less carbs than the standard potato. It’s a cross breed of different potatoes with Dutch origin. In fact these ultra-Dutch potatoes nowadays originate more and more often from the Mediterranean area, because the demand has become too large. The composition of the potatoes differs from other potatoes. 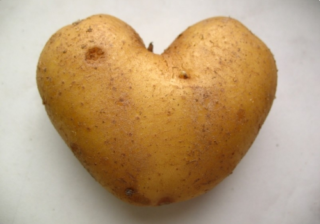 In Australia this little tater is already very popular. But why is this potato so different from others? Why is it so popular? The potato we’re talking about is called Carisma, a potato with (according to some languages) charisma. The manufacturer claims the potato has a different composition than the standard potato. It is said to be a product with naturally slow digestible carbohydrates. When comparing the nutritional value of these potatoes (raw) to other potatoes, the Carisma-potato contains 67 kcal per 100 gram while other potatoes contain 88 kcal per 100 gram. The carbohydrate content is respectively 14.3 and 19.0 gram per 100 gram. In terms of proteins and fibers the potatoes are very similar. The Glycemical Index (GI) also shows significant differences. These were measured by the University of Sydney, where extensive research has been performed into these potatoes. The GI is a measure of how quickly carbs are digested in the intestine and consequently absorbed in the blood as glucose. It thereby indicates how quickly the blood sugar level rises. Products like potatoes and bread usually have a high GI, while products like pulses and vegetables have a low GI. The GI strongly depends on the preparation method. For people suffering from diabetes this is an important indicator, because they have to be extra alert to any rise in their blood sugar level. But these are interesting statistics for all consumers, since a rapid rise of the blood sugar level is seen as something you would want to avoid. By eating products that cause a quick rise in the blood sugar level, the sense of hunger returns much more quickly than with products causing a slower rise. Moreover, the regular consuming of food with a high GI can lead to insulin resistance. According to the Food Centre, food with a GI of around 70 or higher is indicated as having a high GI. Food with a low GI has a value of 55 or less. When looking at the GI of potatoes after boiling, the regular boiled potato has a value of 78, where the Carisma gets to 55. So according to the definition of the Food Centre, regular potatoes belong to the products with a high GI, while the Carisma-potato can be put in the low-GI products category. So, if one of these days you feel like eating taters, try these charismatic Carisma potatoes.